Called the "Quintessence of the Baroque" and "Bridge to the Enlightenment," Mexican writer and nun Sor Juana Inés de la Cruz has also been celebrated as the "First Feminist of the New World." Feminist Perspectives on Sor Juana Inés de la Cruz fills a gap in the scholarship on Sor Juana by exploring the implications of her feminist staus in literary and cultural terms. 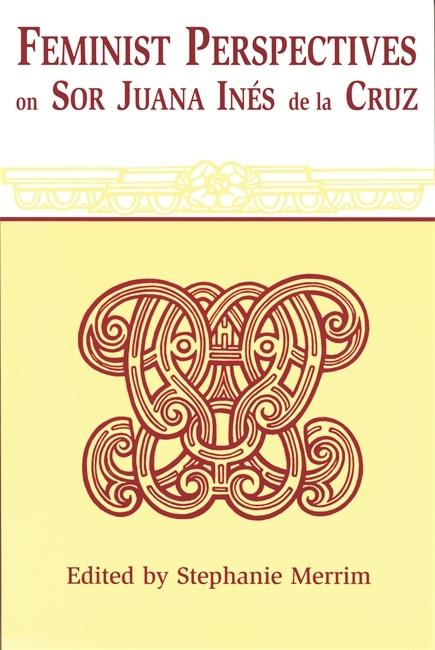 Editor Stephanie Merrim's introduction surveys key issues in Sor Juana criticism from a feminist literary perspective and suggests a blueprint for future studies. Essays by Dorothy Schons and Asunción Lavrin reconstitute essential dimensions or Sor Juana's world, addressing biographical questions about the norms and values of religious life. Moving from social norms to their verbal expression, Josefina Ludmer reads Sor Juana's Respuesta for its stratagems of resistance, and Stehanie Merrim uncovers in Sor Juana's theater the encoded drama of the conflicted creative woman. Stephanie Merrim is a professor of Hispanic Studies and Comparative Literature and chair of the Hispanic Studies Department at Brown University. She is also the author of Logos and the Word (Peter Lang Press, 1983). Stephanie Merrim's Feminist Perspectives on Sor Juana Inés de la Cruz is a carefully organized text that brings together fundamental scholarship on Sor Juana.